Microcirculatory imaging (MI) is used to monitor peripheral perfusion in critically ill or preterm neonates. This manuscript and video demonstrates the optimal approach for obtaining high-quality images. van Elteren, H., Reiss, I. K., de Jonge, R. C. Transcutaneous Microcirculatory Imaging in Preterm Neonates. J. Vis. Exp. (106), e53562, doi:10.3791/53562 (2015). Microcirculatory imaging (MI) is a relatively new research tool mainly used in the intensive care setting. MI provides a clear view of the smallest capillaries, arterioles and venules. The magnifying effect visualizes the flow pattern of erythrocytes through these vessels. It's non-invasive character makes it suitable to apply in (preterm) neonates, even in cardiorespiratory unstable patients. In adults and children, MI is mainly performed sublingually, but this is not possible in preterm infants as these cannot cooperate and the size of the probe is problematic. In preterm infants, MI is therefore performed transcutaneously. 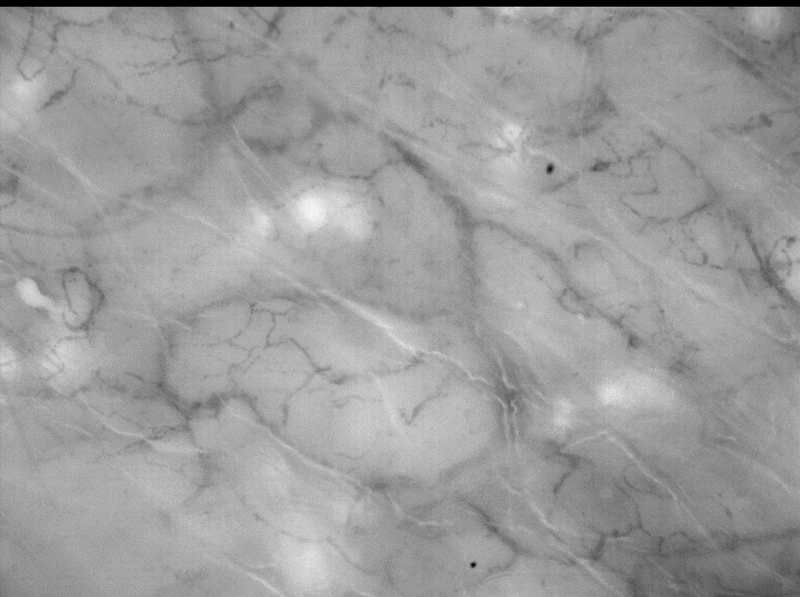 Their thin skin makes it possible to obtain high quality images of peripheral microcirculation. In this manuscript we will demonstrate the method of transcutaneous MI in preterm infants. We will focus on the different techniques and provide tips to optimize image quality. The highlights of software settings, safety and offline analysis are also addressed. Hemodynamic diagnostics in critically ill preterm neonates has always been difficult. Most diagnostic tools used in adults cannot be applied in these tiny preterm infants; and then there is a problem of the sensitivity of the outcome parameters. But most of all, these infants are so vulnerable, that the risks of diagnostic procedures do not outweigh the benefits. As a result, in the field of neonatology, hemodynamics has been neglected and therefore there is a lack of knowledge on this topic. An interesting option for handling these problems might be visualizing the microcirculation. The introduction of handheld microscopes in the late 1990s made it possible to visualize the microcirculation in a non-invasive manner. Three generations of devices have been introduced: Orthogonal Polarization Spectral (OPS) imaging1, Sidestream Dark Field (SDF) imaging2, and Incident Dark Field (IDF) imaging3. They all use more or less the same technique in which green light with a specific wavelength (548nm) stroboscopic illuminates the microcirculation. The green light is absorbed by oxy- and deoxyhemoglobin and mostly reflected by the surrounding tissue. This property of green light therefore creates visible contrast. The reflected light passes a magnification lens and is projected on a camera sensor. Hereby it is possible to visualize the flowing red blood cells at a depth of approximately one millimeter of mucosal tissue or directly at solid organs. Over the past 15 years, the microcirculation has been mainly studied in adults, especially in patients with septic shock4-6. These observational studies found that persistent microcirculatory alterations were associated with organ failure and mortality. This observation cannot be extrapolated directly to (preterm) infants however, as in the adults the microcirculation was measured sublingually. High quality images of the sublingual microcirculation cannot be obtained in preterm infants because they are unable to cooperate. In term infants the buccal microcirculation has been the area of interest7. Fortunately, in preterm infants the thin skin allows transcutaneous microcirculatory imaging. This approach has been applied in neonatal studies focusing on blood transfusion8, therapeutic hypothermia9 and hypotension10. In this manuscript we present our protocol for transcutaneous microcirculatory imaging using Incident Dark Field imaging in preterm neonates. We will focus on different strategies to acquire the highest quality images. Technical details and differences between the SDF and IDF devices can be found elsewhere11. This protocol follows the guidelines of the local human research ethics committee. Schedule the microcirculatory measurement so that it does not coincide with other procedures such as blood sampling. In term neonates it is best performed after feeding. This prevents agitation and will ease the measurement. Ensure that a nurse or a parent attends to support and comfort the neonate during the examination, using the principles of Newborn Individualized Developmental Care and Assessment Program12. Note: Although measurements can be performed by a single person, it is highly recommended to have a second person assist. One holds the camera and is focused on the neonate whilst the other operates the computer and software. In our experience, this results in higher quality images and a shorter duration of the procedure. If the clinical condition of the neonate permits, place the neonate in supine position. Microcirculatory imaging can be performed in prone position, but this requires more skill and patience. Make sure the body temperature of the preterm infant is within appropriate range (36.5 - 37.5 degrees Celsius). Install the device along the incubator. Make sure the incubator is at the right height. Put the disposable cap on the camera. Apply gel, oil or saline on the tip of the probe; this will help smoothen the contact between probe and skin. Place the camera on the ventromedial side of the infants upper arm. To prevent focus-artefacts, make sure the probe is perpendicular to the skin. This may require repositioning of the infants arm. Note: The ventromedial side of the upper arm is the primary location to measure the cutaneous microcirculation. This location has little lanugo hair and is therefore less prone to artefacts. It is most easily reached if the patient is positioned in supine position. To minimize the total length of procedure, gain time by finding the optimal depth of focus (Figure 3) while searching the location with the fewest artefacts. Note: Depth of focus depends primarily on postnatal age rather than gestational age. The average depth of focus in the first week of life is 0 - 80 µm. Hereafter, due to maturing of the skin, the focus depth rapidly increases with average values of 80 - 200 µm between 1 - 4 weeks of postnatal age (Figure 2). In term born neonates the average depth of focus is 80 - 160 µm at birth. Stabilize the probe to avoid movement artefacts. To do so, rest the elbow on the incubator window and the wrist beside the neonate. Alternatively, position the probe alongside the neonate on a pillow. Avoid pressure artefacts by letting the camera only have the slightest contact with the skin. 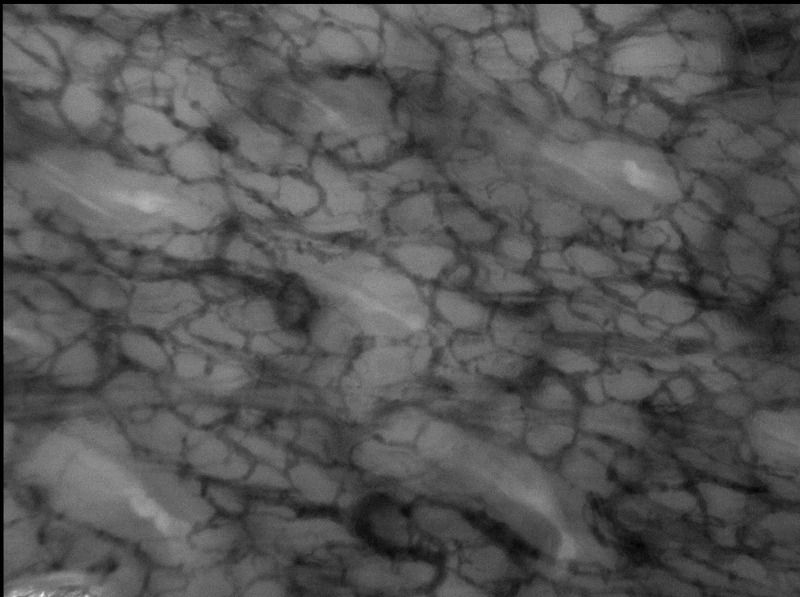 Pressure artefacts can be recognized during image capturing if there is back-and-forth flow in vessels or if large vessels are non-perfused while there is good flow in small vessels. Also if the flow pattern is identical throughout the whole screen, beware of pressure artefacts. Record videos for a minimum duration of 5 sec. After a successful capture, move the camera to another spot on the upper arm. Note: It is recommended to capture in total 5 - 10 videos at 3 - 5 different locations, as some artefacts are only recognized at offline analysis, which means that the video in question is not usable for analysis. Gently remove the gel, oil or saline from the skin with a small gauze. Crop the video if there is a significant movement that impedes analysis. Go to the 'Tools' section and use the button 'Editor'. Select the frame interval eligible for analysis and click the 'Crop Video' button. Note: Videos are acceptable if movement is within ½ of the field view13. Select the cropped video and stabilize it. Go to the 'Tools' section and use the button 'Analysis'. Click the 'Stabilize' button. Note: All movies must be stabilized before automatic analysis can be performed. Select the stabilized video. Go to the section 'Analysis' and click the 'Detect' Button. Make sure the options 'Capillaries' and 'Vessels' are highlighted. After detection (Figure 4), click the 'CNA' or 'De Backer' button for a full microcirculatory report. This report includes the most used outcome parameters like the total vessel density (TVD), perfused vessel density (PVD) and proportion of perfused vessels (PPV). Note: As an alternative, videos can be exported offline to be manually analyzed. This option can be found in the section 'Tools'. Select the option 'Export' and click the 'AVA export' button. Figures 1 and 2 show representative still images of high-quality MI videos. These examples demonstrate the difference in skin thickness in the same infants between day 1 (Figure 1) and day 28 (Figure 2) of postnatal age. On day 1, there is a bright illumination, adequate focus on the micro vessels and minimal presence of artefacts. On day 28 it is more difficult to find the right balance between focus on the micro vessels and artefacts due to the thicker skin. Note that stability, duration and pressure artefacts cannot be judged on these still images. This should be noticed during the acquiring of the images or before offline analysis. Figure 1. MI of Preterm Infant 24 Weeks Gestational Age, Day 1. Transcutaneous MI of an infant born at a gestational age of 24 weeks. The postnatal age of the infant is 1 day. The used depth of focus is 40 µm. Please click here to view a larger version of this figure. Figure 2. MI of Preterm Infant 24 Weeks Gestational Age, Day 28. Transcutaneous MI of an infant born at a gestational age of 24 weeks. The postnatal age of the infant is 28 days. The used depth of focus is 160 µm. Please click here to view a larger version of this figure. Figure 3. Differences is Focus Depth. These two images of the exact same area highlight the importance of adequate focus depth. Inadequate focus (left) results in loss of vessel visibility compared to adequate focus (right). Please click here to view a larger version of this figure. Figure 4. Results of Automatic Offline Analysis. This figure shows the results of automatic offline analysis. Please click here to view a larger version of this figure. In this manuscript we describe and demonstrate the approach for transcutaneous microcirculatory imaging in preterm neonates. Visualizing this method will help researchers overcome two of the biggest challenges in research: reproducibility and the time and labor intensive nature of learning new techniques. This technique can provide useful information of peripheral microcirculation in preterm infants in a non-invasive manner. Serial measurements can help clinicians evaluate the effects of therapeutic interventions. The microcirculation is the area where the final step of the oxygen transport chain occurs. Observational studies have demonstrated a relation between microcirculatory deterioration over time and the presence of bacterial infections14. As deterioration of the peripheral microcirculation is one of the first signs of sepsis in preterm infants, it is generally hypothesised that the peripheral microcirculation can help predict the development of sepsis. The quality of the images mainly depends on the skills of the operator. Although the latest camera devices provide better technical specifications and hardware, this is still of secondary importance. Operators should be properly trained in microcirculatory imaging. They should be familiar with the recommendations of the round table conference held in Amsterdam in 200615 and with the quality criteria developed by Massey et al13. These six criteria (illumination, duration, focus, content, stability, pressure) are the foundation of high quality and trustworthy data. Inexperienced operators are likely to fail in recognizing frequently occurring pressure artefacts16. Note however that these quality standards and recommendations have been drafted for sublingual MI measurement in adults and cannot be directly extrapolated to cutaneous MI measurements in preterm infants. The quality criteria of duration and content are therefore harder to accomplish. Also, it is highly recommended to perform the measurements with two operators and ask a nurse or parent to attend. The camera must be held steady, pressure artefacts must be avoided, the software must be operated and the infant's well-being must be considered. Especially if the infant moves a lot, this is too much for one operator. It is therefore better to have one person handle the camera and focus on the area of measurement and another person operate the software and check the infant's vital signs. Naturally, besides the technical aspects of MI, experience in handling (critically ill) preterm neonates is essential for operators. Despite its non-invasive character, MI still carries a potential burden and risks. Limit the duration of measurements to a minimum to prevent that the incubator and thereby body temperature drops too much. Always apply a disposable protection cap on the camera before measurements. The function of this cap is twofold: It protects the skin from potential warming of the probe tip and it serves as an artificial barrier to prevent bacterial transmission. In addition, MI equipment should be regularly disinfected. Also, apply just a little amount of gel or oil on the skin and gently remove it after the measurement. If misused, the combination of oil and therapeutic phototherapy can have devastating effects on the skin. Although mostly infants hardly react to the measurements, cardio-respiratory instability cannot be excluded. This is the reason why we recommend having the infant supported by a parent or nurse. After data acquisition, offline analysis of the videos should be performed in a standardized manner. Commercial software is available to automatically analyze MI videos according to the guidelines15. Manual analysis comprises three steps. First, contrast enhancement can be applied in order to attain the optimal contrast. Second, videos should be stabilized. This step will bring out the importance of stability during the measurements. For the slightest drift can make a video unusable for analysis. Third, vessels must be drawn and flow must be categorized. Note that this final step carries a high risk of poor inter observer variability17. Manual offline analysis should therefore be performed by trained researchers only. There are two methods for reporting the outcome measures. 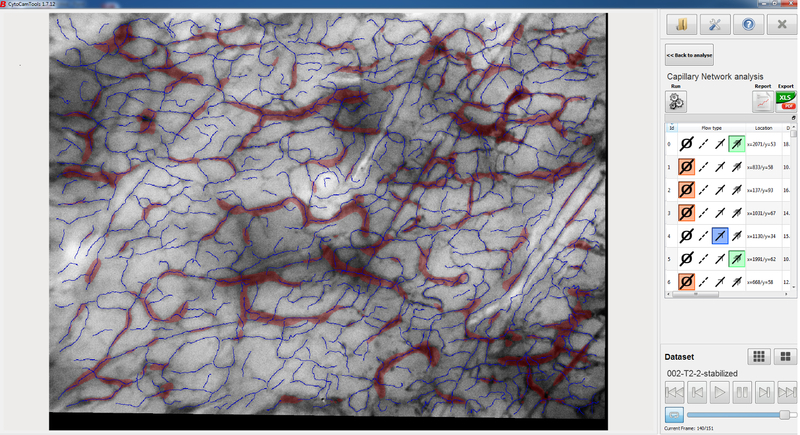 The conventional method of capillary network analysis (CNA) reflects the total length of vessels divided by the measured surface area (mm/mm2). Alternatively, the less time consuming De Backer Score (DBS) can be used. In this score, three equidistant horizontal and three equidistant vertical lines are drawn on the screen. Vessel density can be calculated as the number of vessels crossing the lines divided by the total length of the lines (n/mm). There are drawbacks to the research field of microcirculation. Heterogeneity of the microcirculation makes is complicated to establish reference values. Therefore, most of the research are observational studies or comparisons between groups. The rather complex evaluation of microcirculatory videos and subjective human interference increases the possibility of poor reproducibility (Van den Berg, 201517). It is therefore important that the method of obtaining videos is standardized. For the near future, technical advances will improve the research in cutaneous MI. An example is automated computer analysis of the video images, which will replace the relatively subjective human assessment of microvessels and thereby rule out inter observer variability. A good example to standardize this field of research is the use of wireless imaging sensors, which serially measure the microcirculation at the exact same location. This will make cutaneous MI less operator dependent. We thank J. Hagoort for reading and correcting the manuscript. CCTools Braedius http://www.braedius.com/magnoliaPublic/braedius/products.html Another well known offline analysis programme is AVA (Microvision medical). Groner, W., et al. Orthogonal polarization spectral imaging: a new method for study of the microcirculation. Nat Med. 5, (10), 1209-1212 (1999). Goedhart, P. T., Khalilzada, M., Bezemer, R., Merza, J., Ince, C. Sidestream Dark Field (SDF) imaging: a novel stroboscopic LED ring-based imaging modality for clinical assessment of the microcirculation. Opt Express. 15, (23), 15101-15114 (2007). Sherman, H., Klausner, S., Cook, W. A. Incident dark-field illumination: a new method for microcirculatory study. Angiology. 22, (5), 295-303 (1971). Trzeciak, S., et al. Early microcirculatory perfusion derangements in patients with severe sepsis and septic shock: relationship to hemodynamics, oxygen transport, and survival. Ann Emerg Med. 49, (1), 88-98 (2007). Sakr, Y., Dubois, M. J., De Backer, D., Creteur, J., Vincent, J. L. Persistent microcirculatory alterations are associated with organ failure and death in patients with septic shock. Crit Care Med. 32, (9), 1825-1831 (2004). De Backer, D., et al. Microcirculatory alterations in patients with severe sepsis: impact of time of assessment and relationship with outcome. Crit Care Med. 41, (3), 791-799 (2013). Buijs, E. A., et al. Early microcirculatory impairment during therapeutic hypothermia is associated with poor outcome in post-cardiac arrest children: A prospective observational cohort study. Resuscitation. (2013). Genzel-Boroviczeny, O., Christ, F., Glas, V. Blood transfusion increases functional capillary density in the skin of anemic preterm infants. Pediatr Res. 56, (5), 751-755 (2004). Ergenekon, E., et al. Peripheral microcirculation is affected during therapeutic hypothermia in newborns. Arch Dis Child Fetal Neonatal Ed. 98, (2), F155-F157 (2013). Schwepcke, A., Weber, F. D., Mormanova, Z., Cepissak, B., Genzel-Boroviczeny, O. Microcirculatory mechanisms in postnatal hypotension affecting premature infants. Pediatr Res. (2013). van Elteren, H. A., Ince, C., Tibboel, D., Reiss, I. K., de Jonge, R. C. Cutaneous microcirculation in preterm neonates: comparison between sidestream dark field (SDF) and incident dark field (IDF) imaging. J Clin Monit Comput. (2015). Als, H., et al. Individualized Behavioral and Environmental Care for the Very-Low-Birth-Weight Preterm Infant at High-Risk for Bronchopulmonary Dysplasia - Neonatal Intensive-Care Unit and Developmental Outcome. Pediatrics. 78, (6), 1123-1132 (1986). Massey, M. J., et al. The microcirculation image quality score: development and preliminary evaluation of a proposed approach to grading quality of image acquisition for bedside videomicroscopy. J Crit Care. 28, (6), 913-917 (2013). Weidlich, K., et al. Changes in microcirculation as early markers for infection in preterm infants--an observational prospective study. Pediatr Res. 66, (4), 461-465 (2009). De Backer, D., et al. How to evaluate the microcirculation: report of a round table conference. Crit Care. 11, (5), R101 (2007). Sallisalmi, M., Oksala, N., Pettila, V., Tenhunen, J. Evaluation of sublingual microcirculatory blood flow in the critically ill. Acta Anaesthesiol Scand. 56, (3), 298-306 (2012). van den Berg, V. J., et al. Reproducibility of microvascular vessel density analysis in Sidestream dark-field-derived images of healthy term newborns. Microcirculation. 22, (1), 37-43 (2015).